The Advanced Research Projects Agency Network (ARPANET) was a project which began in the Pentagon. In 1969, ARPANET developed packet switching. What would follow from these experiments was the development of the initial protocols which would define the internet, including TCP/IP, packet switching, and email developments. TCP v1 was designed in the spring of 1973 by Robert Elliot Kahn and Vinton Cerf. In August 1977, Jon Postel, an American computer scientist and editor of the Request for Comment (RFC), changed the TCP protocol to TCP/IP and split TCP and IP into two distinct operating layers. This became TCP v3 in 1978. The first formal standard (or public) version of IP was version 4 – IPv4 - created in 1980 (TCP/IP v4) and defined in RFC 760. IPv4 was described in IETF (Internet Engineering Task Force) publication RFC 791 (September 1981), replacing the earlier definition in RFC 760. The Domain Name System (DNS) was created to make internet navigation easier In November 1983, through the publication of RFC 882. In October 1984, RFC 920 was published to define a series of top-level domains (.com, .gov, .edu, etc.) to provide domain space to various types of organizations. Jon Postel established and founded the Internet Assigned Numbers Authority (IANA). The term IANA is first referred to in RFC 1083. Postel was named Deputy Internet Architect and RFC Editor. Sir Tim Berners-Lee invented the World Wide Web, which was essentially the standard for URLs, HTTP, and HTML. The High Performance Computing and Communications Act passed in the US under Senator Albert Gore through senate bill S.272. One of the key activities of the bill was to give responsibility to the National Science Foundation (NSF) to, among other things, provide networking infrastructure support for science and engineering disciplines. The RIPE (Réseaux IP Européens) NCC was formally established in April 1992 and began to do IPv4 address distribution. In September 1993, CIDR (Classless Inter-Domain Routing) was introduced to slow the growth of routing tables and to help slow the exhaustion of IPv4 addresses. The original specification in RFC 1519 was later replaced by RFC 4632. APNIC (Asia-Pacific Network Information Centre) was formed to allocate address space in the Asia-Pacific region. The National Science Foundation (NSF) took responsibility for non-military domain name registration. They awarded a five-year agreement to Network Solutions, Inc. (NSI) to handle this task. At the time there were only 7,500 domain names. In May 1994, the first RFC document on Network Address Translator (NAT) was published (RFC 1631). NAT is a technology used to prolong IPv4 availability. It does this by translating a private address in an internal network into legal public addresses. In September 1995, domain name registration started to become mostly commercial, as the NSF authorized NSI to charge a fee for new domain names. In December 1997, ARIN (American Registry for Internet Numbers) formed as a nonprofit corporation. It provided IP registration and allocation in North America. The IETF initiated the design and development of IPv6, a replacement for IPv4, as early as 1994 with a formal description in 1995 under RFC 1883. The first specification was published in 1998 by RFC 2460, which was later superseded by RFC 8200 and is the current and updated specification. IPv5 was designed as a Stream Protocol, which failed, and was never announced publicly. In November 1998, ICANN (Internet Corporation for Assigned Numbers and Names) Incorporated as a nonprofit organization. Part of their service is to oversee domain name registration and the global registries. LACNIC was established, providing management of internet number resources to 33 territories in Latin America and the Caribbean. AFRINIC was incorporated as the internet registry for Africa. In February 2005, the Early Registration Transfer Project (ERX) was implemented to transfer internet resource records from ARIN to the RIR in which they were used. In February 2011, the primary address pool of the internet, managed by IANA, was exhausted when the last 5 blocks were allocated to the RIRs. In April 2011, APNIC was the first RIR to exhaust its regional address pool, except for a small amount of address space reserved for the transition to IPv6. In 2011, the first commercial transfer of IPv4 addresses took place between Nortel and Microsoft. This transfer was managed by Sandra Brown, who was the Director of Engineering at Nortel at the time. In May 2011, IPv4 Market Group, LLC was incorporated. On August 9, 2011, APNIC was the first RIR to implement an Inter-RIR Transfer Policy. On July 31, 2012, ARIN implemented its Inter-RIR Transfer Policy. On September 12, 2012, RIPE exhausted the last IPv4 blocks from its available pool of addresses. By the end of 2012, just over 10 million IPv4 addresses had been transferred through the RIRs – cumulative since 2009 (refer to figure 1). The first ARIN to APNIC IPv4 Inter-RIR transfer was processed. LACNIC announced its service region was considered exhausted after reaching one /10 block of remaining IPv4 addresses. In December of 2014, the average Price/IP of a /16 was approximately $5/IP (refer to figure 2). By the end of 2014, about 37.7 million IPv4 addresses had been transferred through the RIRs – cumulative since 2009 (refer to figure 1). In January of 2015, native IPv6 utilization hit approximately 5% as measured by connectivity among Google users. On September 24 2015, ARIN ran out of its free pool of IPv4 addresses. On September 30 2015, RIPE implemented its Inter-RIR Transfer Policy for internet resources authored by Sandra Brown of IPv4 Market Group. By the end of 2015, about 90.4 million IPv4 addresses had been transferred through the RIRs – cumulative since 2009 (refer to figure 1). In January of 2017, the average Price/IP of a /16 was approximately $10/IP (refer to figure 2). By the end of 2017, about 190.4 million IPv4 addresses had been transferred through the RIRs – cumulative since 2009 (refer to figure 1). In January of 2018, native IPv6 utilization hit 20%. 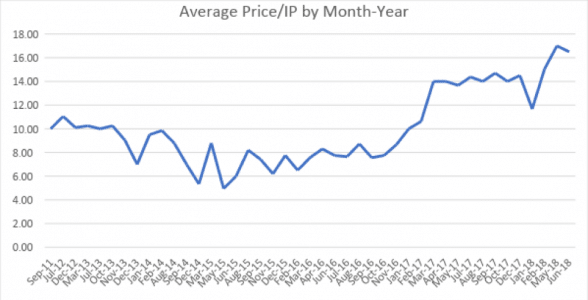 In February of 2018, the average Price/IP of a /16 was approximately $15/IP (refer to figure 2).